A new page is all I ask. 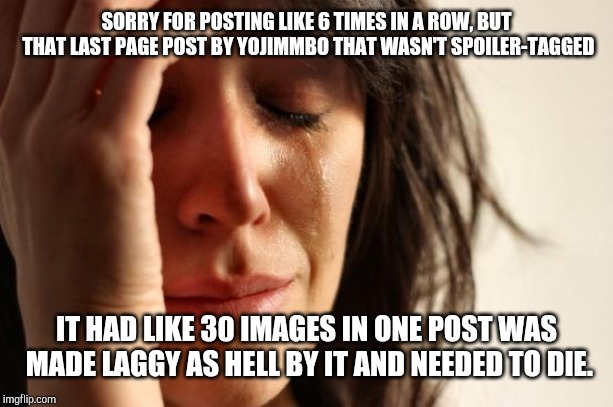 Sorry for posting like 6 times in a row, but that last page post by Yojimmbo that wasn't spoiler-tagged even though it had like 30 images in one post was made laggy as hell by it and needed to die. That is all. Carry on. Was doing the Shadowlord fight on a mule just now and this came to mind so I put it together. Not funny "haha", but meh. Due to the new forum rules, the old thread is being nuked. It's over 900 pages long, and there are numerous offending posts in it. And by numerous, I mean probably at LEAST one per page. Not including quotes. Take the time to read through the below forum rules if you already have not. Remember, intentionally bypassing the profanity filter is not allowed. - Slurs based on race, ethnicity, sexual orientation, or similar protected statuses are not permitted, even in jest, or even by members of the same group. - Overly hostile and repeat attacks against a given user which would normally fall under harassment policies in-game will no longer be allowed. - Posting any personal real-life identifiable information or images about a particular user without their permission is not allowed, unless they have previously posted it here. - Do not link to or advertise external sites for blatant 3rd party hacks and tools that would probably get you immediately banned from FFXI/XIV. Guildwork Client and Windower are ok.
- These policies apply to all sections of the site: forum, item and player comments, screenshots, avatars, etc. Images violating any of the above rules will be removed if discovered by an admin or mod. I will lock the other thread for now to give users time to save their favorites. It will be trashed this afternoon or tomorrow. Edit: Do not expect a moderator to take the time to edit your post to remove a single image bypassing the profanity filter. If that is done, it is as a courtesy, not a requirement. If you are derailing or attacking someone, you risk your post being deleted regardless of including a picture in it. Those that bypass the profanity filter risk being topicbanned. There is a profanity list. If you can't take the time to read it, then don't post images.